What paperwork do I need to complete in order to receive AB 110 interim funding? A: In order to receive interim funding, which expires on June 30, 2018, for those who have a child placed with them on an emergency basis while RFA is pending, caregivers must have completed an RFA application. 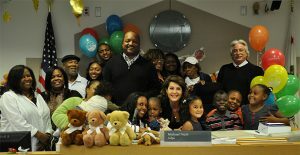 Relatives caring for a non-federally eligible child must also sign the Approved Relative Care (ARC) application in order to receive AB 110 funding. The child’s eligibility worker will determine the child’s eligibility for federal funding and the caregiver will be provided the ARC application by the county worker, if necessary. In addition, the Emergency Assistance (EA) application must be completed by the county worker if the child is with a non-related extended family member (NREFM), or if the child is federally eligible and placed with a relative. AB 110 funding cannot be initiated until an RFA application is submitted. For example, for a caregiver who has not submitted an RFA application, with whom a child was placed prior to March 30, 2018, that caregiver may only receive funding from the day an RFA application is completed through June 30, 2018. ← How can I learn more about the new interim funding available to caregivers who took placement of a child prior to being approved as a resource family?